The secret to every good manicure often has more to do with the way you prepare your nails, than the shade you choose to paint on. Investing in some quality base coats and nail care products has the double benefit of caring for, and protecting your nails, and giving your manicure a more long-lasting, salon quality finish. 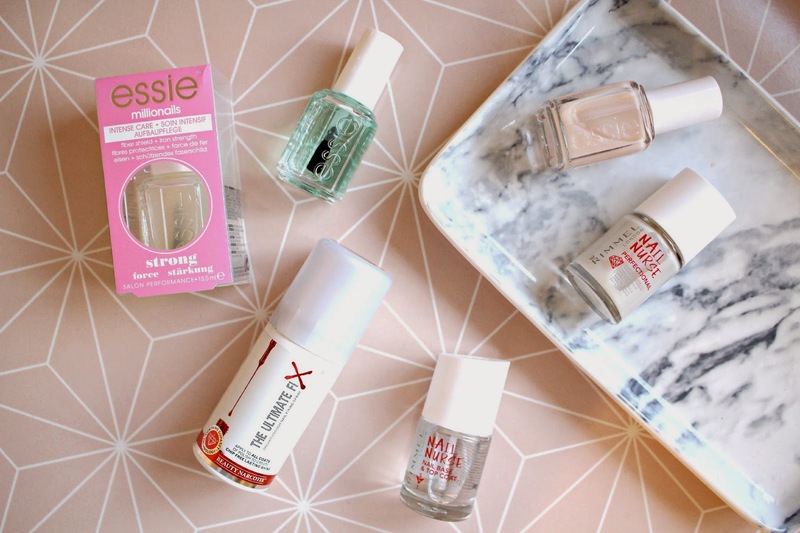 Here are my favourites, from Essie, Rimmel and The Ultimate Fix for my second edition of Mani Monday! Essie Millionails – if you suffer from weak nails that perhaps break, peel or bend easily, apply a coat of Millionaires first to fortify your nails with iron and a fibre shield. The ingredients actively repair nails so you can bid farewell to peeling and splitting! This is a particularly great product if you are trying to ‘recover’ from a gel manicure. Essie First Base bast coat – this polish acts as an adhesive and a primer to be applied first before any polish. With a rubber – like adhesive, it ensures your polish has a strong bond to the nail, so no more peeling just a few days after you applied the nail varnish. Available from Space NK here. Essie Fill the Gap – this product is sold as ‘anti aging for nails’ as the base coat fills in ridges, conceals imperfections and fortifies with nutri-keratin and bamboo extract. Although at 23 my nails aren’t in need of ant-aging, I apply this polish to smooth out ridges caused from gel polish removal, or when my nails are long and getting a few ridges. Rimmel Nail Nurse Perfectionail – A budget friendly version of Essie’s Fill the Gap, Perfectional also effectively fills ridges in nails and creates a smooth base coat ready for varnish application. The only noticeable difference is the texture of the polish, Essie’s is a smooth and light pink shade, where as the Rimmel is a little thicker, and leaves a clear/milky finish. Available from Boots. Rimmel Nail Nurse Nail Base and Top Coat – a super multi tasking polish with 5 in 1 benefits. The polish smooths and strengthens nails while also moisturising and protecting. The formula delivers a high shine finish which is great for applying colour over the top to give a smooth and flawless application, but also as a top coat to give a high shine, gel – like finish. Available from ASOS. The Ultimate Fix Nail Fixing Spray – One which I mentioned in my first Mani Monday post here, and is so good that it needs to feature in this one too! An easy to use spray which seals your polish between coats to give an even longer lasting manicure. Use this as well as a great base coat, and your manicures will last noticeably longer. Available from Selfridges. What are your nail care essentials?